Máirtín O’Connor is one of the most respected and best loved musicians ever to emerge from Ireland. 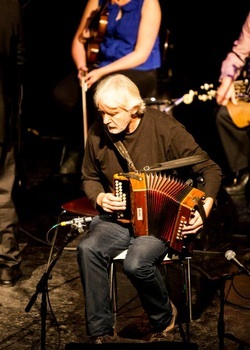 Through his work with De Dannan, Midnight Well and Skylark and also as a solo artist he has quite simply gone where no Irish accordion player had gone before. His solo debut 'The Connaughtman's Rambles' (1978) is now widely considered a landmark recording of Irish music. Many fine musicians have played in Máirtín’s bands. For the past 10 years the group has included multi-all Ireland winner Cathal Hayden and former Dervish member Séamie O’Dowd with percussionist Jim Higgins joining them occasionally. In 2009 the trio released the much anticipated album ‘Crossroads’. Máirtín’s previous albums ‘The Road West’. 'Chatterbox' and ‘Rain of Light’ are considered ground-breaking and captivating. A prolific writer of new material, Máirtín’s tunes can be heard on the recordings of many artists and at sessions throughout the world. A selection of these tunes have been collected in the book 'Inside the Box, Outside the Box'. Mairtín was a special guest with The Irish Memory Orchestra during their debut concert. The success of Mairtín's partnership with the orchestra led to Dave Flynn asking Mairtín to become the first Honorary Guest Member of the IMO, meaning Mairtín will perform as a guest member when his hectic international touring schedule permits! Mairtín also brings his considerable talents as a composer to the IMO. The IMO features several of his compositions in new arrangements by Dave Flynn.